« A tea plant of my very own! I’m always trying to think of easy tutorials for Pagan families to do together, especially projects that help people learn and perfect useful skills like sewing. This one is to celebrate Beltaine. During this season we delight in the new life bursting forth everywhere. It is also a time to be flirty and sensuous. The ancient Celts were described by historians as wearing colorful clothing and a lot of jewelry. They were a people who appreciated art and wore it proudly. 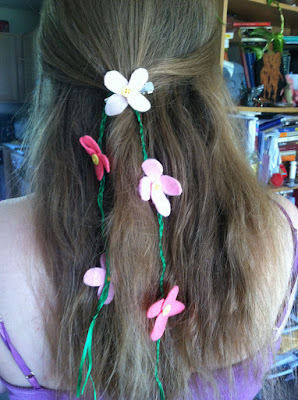 In the spirit of their showy nature, the lusty month of May, and the blossoms outside, I came up with this floral garland hair clip. The finished piece worn in the back of my hair. Step 1: Gather your materials. 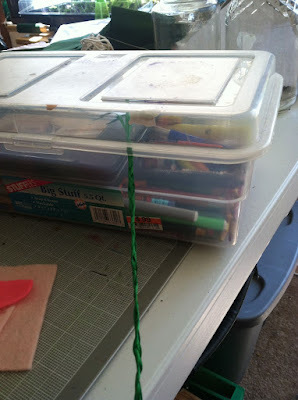 Pictured are scissors, three equal strands of slender green ribbon, three different colors of felt scraps, buttons, corresponding thread, and a needle. Not photographed is the hair clip. These were all materials I had laying around. The felt was made from recycled products. I highly suggest using a hair clip that you can stitch on rather than glue. While some glues are very sturdy, I’ve found that good stitching gets the job done just as well and without the fumes or high temperatures. As far as children go, the most dangerous aspect of this project is the needle. If you make this with children, make sure they’re dexterous enough to handle it. 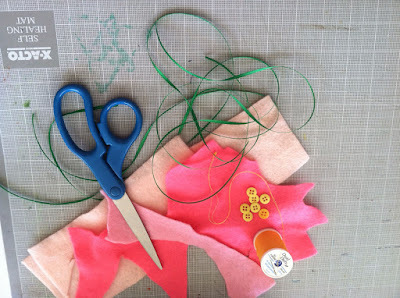 Step 2: Gather your ribbons and make sure they’re equal. I don’t suggest making it very long unless you have exceptionally long hair. You’ll be folding the garland in half and attaching the clip midway. Test the length against your hair. Doyle just loved this activity. 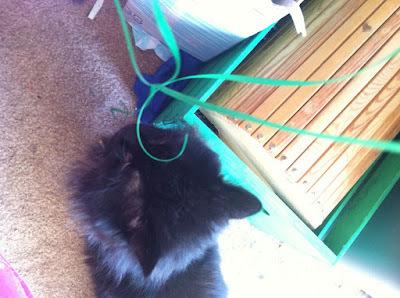 Step 3: Knot and somehow secure that end of the ribbons to something so that you can easily braid. If you’re anything like me, you have tons of art supplies in boxes and crates. I used this tub of colored pencils to keep my ribbons in place. Knot the other end. When your’e done, you’ll have a nice garland! 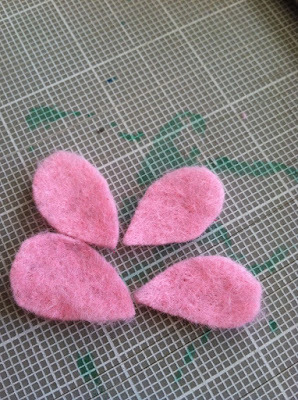 Step 4: Cut out teardrop shapes from the felt. They can be small, medium, or large. I eyeballed them. They don’t have to be perfect – just similar. If you are a perfectionist, you can make a little pattern but for something so small that will be clustered, I find the process tedious and unnecessary. 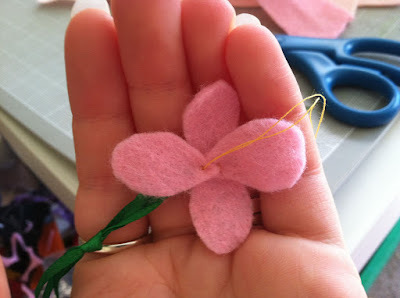 Another option is to buy precut felt flowers at the store but that’s not as fun for me. 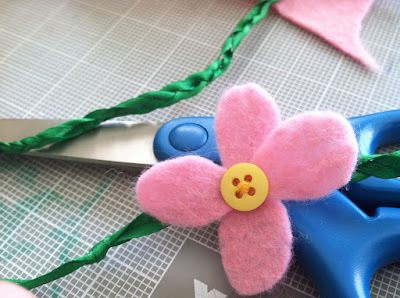 Step 5: Stitch your petals onto the braided ribbon garland. I suggest doing this first rather than adding the button at the same time. Doing it together becomes cumbersome and you might not adequately secure all the petals. This is especially important for wee ones learning how to sew. Step 6: Add your buttons. Make sure they’re fully secured by stitching through the holes several times. Little ones might benefit from two holed buttons to simplify the process. Step 7: Repeat steps 4-6 for as many times is necessary. Attach the flowers at desired intervals. My garland ended up having 5 flowers but this will vary depending on the size of your flowers, the number you make, the space you utilize, and the length of your ribbon. To make them even, I suggest using an odd number of flowers. Step 8: Securely stitch the hair clip to the most central flower. As with the button, pass the needle and thread through the openings several times. Step 9: Wear and enjoy! You can pull strands of hair to the back of your head and wear it as I did, or you can clip some hair on the side of your head and wear it so the ribbons hang closer to your face. I think this project is a fun way to get into the spirit of the warm season. Most of the time, you see ladies and girls wearing floral circlets. For work and school, where you might not want to stand out so much, a clip like this is just the ticket to add some floral flair to your look while celebrating Beltaine. Besides changing the colors of the felt, thread, and buttons, other possible variations include: shorter ribbons for people with shorter hair or who don’t want something quite as showy; leaves rather than flowers; one leaf or flower with a garland of bells.